Ten years after the original publication of this highly revered and sought after book, Volume 2 has been published. In Volume 2 the author records the fine details of the engine compartment, interior, boot, body trim and optional extras, while also providing contemporary documentation (such as the paperwork that accompanied cars when new, manuals, catalogs and advertising material). Color finishes are examined in detail (including body color schemes, color swatches and paint mixing formulas). The countless modifications and changes to the basic configuration made to the XK 120 during its production are also described in depth, with a painstaking thoroughness and a love for detail to which probably no other single model series has ever before been subjected. The appendix includes a chronology of trim changes, a list of 1950s suppliers to Jaguar, an international schedule of competition successes as well as a comprehensive sporting history of the private Swiss XK 120 owners - an aspect of the XK 120 legend previously given far too little attention in Jaguar literature. Crucially, in his quest for authenticity the author once again bases his researches on the examination of original, un restored XK 120s and components. The result is a comprehensive collection of color and black and white photographs and illustrations which are totally authentic and illustrate all the details described in the text. 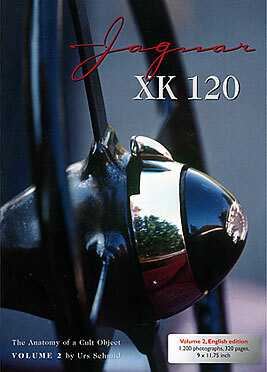 So the book transports the reader on a fascinating journey into the world of XK originality.